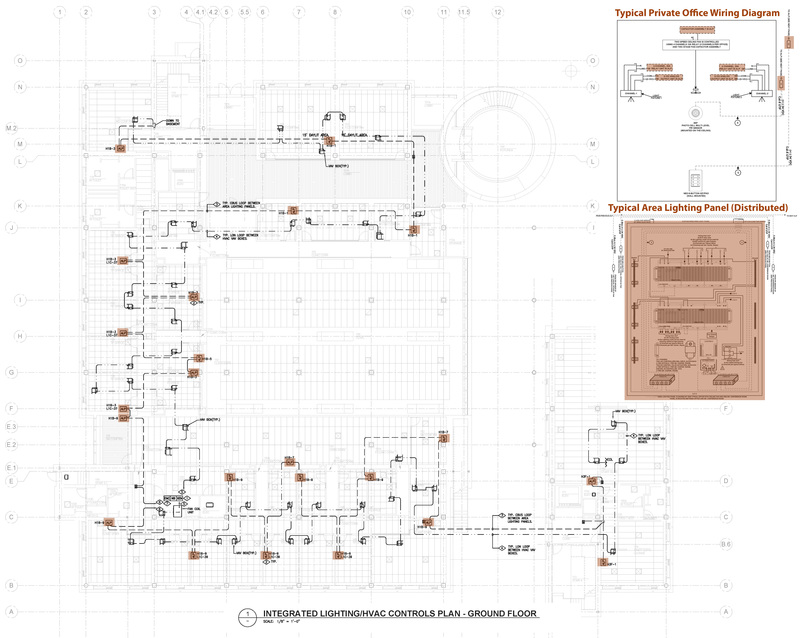 This month, we will explore the lighting control scheme for Stanford Law School’s William H. Neukom Building. Lighting control design by Jamie Fox, Lighting Designer, The Engineering Enterprise. Photography by David H. Collier. Lighting control manufacturer: Schneider Electric (Clipsal). The Stanford Law School’s William H. Neukom Building is a 65,000-sq.ft. student law clinic and faculty office building, designed to encourage interaction with faculty and students. Daylighting opportunities were available in nearly every facet of the building, amplified by strong architectural attention to the natural environment. The project was designed to be at least 30% below California’s Title 24 energy code. The Owner mandated cutting-edge energy efficiency and occupant comfort, with 40 footcandles (fc) available at the desk level. The lighting controls passed the value engineering test with an aesthetic, flexible, state-of-the-art system. Unique to the building is the unprecedented synergistic control of LIGHTING, CEILING FAN, and TEMPERATURE adjustments at single-gang low-voltage stations, saving overall costs. The system utilizes distributed lighting control panel architecture, with a communication network for central programming/setpoints, and gateways to the building management system. Upon entering private offices, combination motion/photo sensor turns lights automatically ON or manual-ON (depending on previous occupant). The closed-loop daylight harvesting signal adjusts 0-10V ballasts to 40 fc, with a twenty-second ramp to minimize observation while maximizing responsiveness to manual window shade adjustments near operable windows. 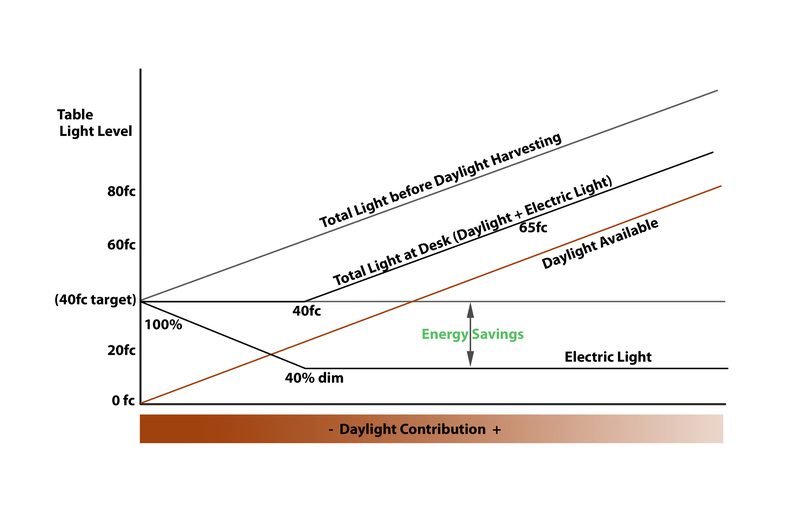 As natural daylight increases, minimum electric light level is held at 40% to balance vertical and horizontal illumination. Typical results are: 65 fc, minimum glare, and an excellent lighting power density of 0.5W/sq.ft. Balancing the minimum dimming level ensured the system would be utilized and not disabled by the occupants. Symbols replaced words for LIGHTING, ceiling FAN, and TEMPERATURE at the light switches (similar to European exit sign graphics). Aesthetic wall switches control scenes and equipment in public spaces. The emergency inverter specified allows instant-ON for ceramic metal halide fixtures without re-strike. Select stairwell fixtures placed on dual motion sensors, photocell or celestial timeclock, to follow occupant use. The daylight harvesting control-loop setpoints were commissioned by the designer, to maximize energy savings.